Smoker Oven with 5 wire shelves (345х345mm). Meat capacity - 16kg. Smoker Oven (the cabinet is entirely of stainless steel) on 4 casters, with 5 wire shelves (345х345mm). Meat capacity - 16kg. Wire grids can be placed above each other with 127mm space. 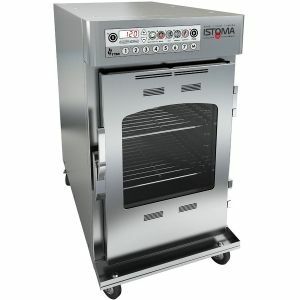 The smoker oven is designed for hot smoking of ribs, bacon, pork, poultry, vegetables, salmon and other. It can be used also for cooking. Insulating material at walls and top reduces outer surface heating. A heat-resistant gasket ensures door hermetic sealing. Removable grids and trays are dishwashable. A removable stainless steel grease collector is underneath. Smoking is very simple: to put some wood chips, to load product, to close the door and to set right temperature and time with a mechanical thermoregulator and with a timer (up to 12 hours). Smoker Oven with 5 wire shelves (345х345mm). Meat capacity - 16kg. 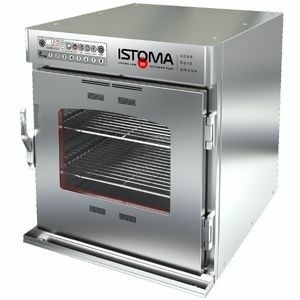 Smoker Oven with 5 wire shelves (430х430mm). Meat capacity - 36kg. Smoker Oven (the cabinet is entirely of stainless steel) on 4 casters, with 5 wire shelves (430х430mm). Meat capacity - 36kg. Wire grids can be placed above each other with 150mm space. 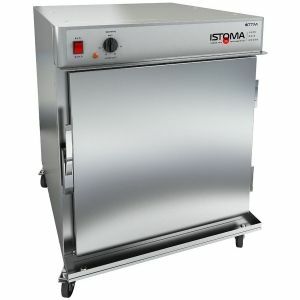 The smoker oven is designed for hot smoking of ribs, bacon, pork, poultry, vegetables, salmon and other. It can be used also for cooking. Insulating material at walls and top reduces outer surface heating. A heat-resistant gasket ensures door hermetic sealing. Removable grids and trays are dishwashable. A removable stainless steel grease collector is underneath. Smoking is very simple: to put some wood chips, to load product, to close the door and to set right temperature and time with a mechanical thermoregulator and with a timer (up to 12 hours). Low Temperature Holding Cabinet, interior volume - 190l. Product capacity - max.45kg. Low Temperature Holding Cabinet, interior volume - 190l. Product capacity - max.45kg. The 3D Surround Heat system assures uniform heating and constant temperature around the product in the compartment without a forced convection system. Uniform heat distribution is due to heating elements around the compartment. This method of delicate cooking preserves natural product moisture and eliminates use of drying fans for heat distribution and humidification. The cabinet has an intuitive electromechanical control with a holding thermostat (+30С to +95С). Cabinet interior includes ten (10) pairs of side runners for GN2/1 pan spaced on 40mm centers. Pans are not included. Interior dimensions - 560х520х660mm. Completed with two wire shelves, a tray, a removable grease collector and four swivel casters. The oven's height without the casters - 730mm. 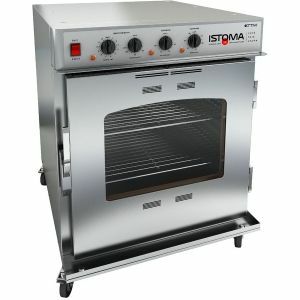 Low Temperature Oven, interior volume - 190l. Product capacity - max.45kg. 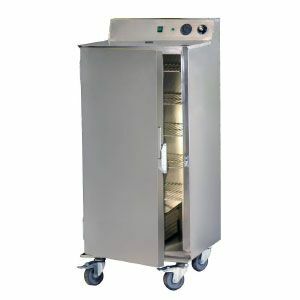 Low Temperature Smoker Oven, interior volume - 100l. Product capacity - max.15kg. Low Temperature Smoker Oven, interior volume - 190l. Product capacity - max.45kg.